Americanflat looks beyond the frame. We are dedicated to providing quality frames that will allow your keepsakes to be prominent and maintain their distinction through time. 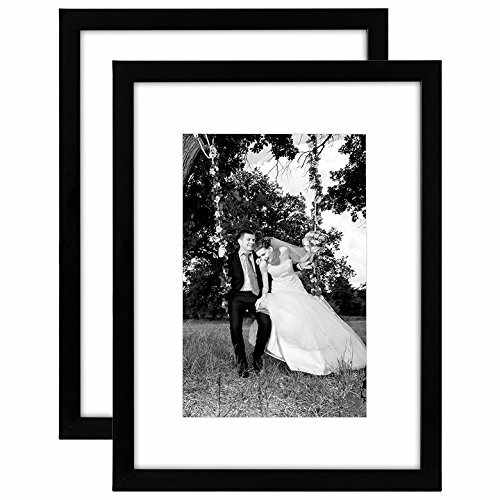 Our 2 Pack -12x16 Inch Black Picture Frames come with acid-free white mats that have 8x12 inch openings. Without the mats, these frames can hold 12x16 inch pictures. The actual mat openings are 7.5x11.5 inches. They are designed to hold 8x12 inch photos in place. We recommend taping the photos to the backs of the mats. These frames are great for displaying precious memories with your loved ones. Our 12x16 Black Wooden Frames are crafted for durability and the glass fronts will preserve your pictures for years to come. They are simple and easy to use. The built-in metal tabs allow for easy access to load your photos, cards, and memories quickly and securely. Order your Americanflat frames now and join thousands of other satisfied customers who LOVE the Americanflat experience. DESIGN: Sleek black wooden 12x16 frames and white acid-free mats with 8x12 inch openings. DISPLAYS: 12x16 inch pictures without the white mats, or 8x12 inch pictures with the white mats. The actual mat openings are 7.5x11.5 inches. They are designed to hold 8x12 inch photos in place. We recommend taping the photos to the backs of the mats. WHITE ACID-FREE MATS: Help draw attention to the frames and make your pictures more noticeable. They also protect your pictures from wear and tear. EASY TO MOUNT ONTO WALL: Come with easy to install hanging hardware to mount onto wall. You can hang the frames vertically or horizontally.